African Film and Literature explores the creativity of film adaptation practices in contemporary South and West Africa, as well as the representation of violence on film. Analyzing a range of films inspired by African and non-African literature, Dovey identifies a specific trend in contemporary African filmmaking – one in which filmmakers are using the embodied audiovisual medium of film to offer a critique of physical and psychological violence, not only within Africa but globally. Against a detailed history of the medium’s savage introduction and exploitation by colonial powers in two very different African contexts, Dovey examines the complex ways in which filmmakers from South and West Africa engage with issues of the past and present, reframing the history and the literature they adapt to address audiences in Africa and elsewhere. 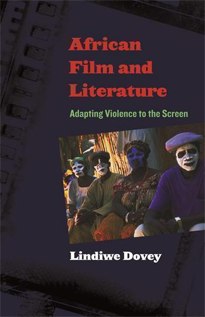 Through this deliberate and radical re-historicization of texts and realities, Dovey argues that African filmmakers have developed a method of filmmaking that is distinct from European and North American forms of film adaptation, and that these same filmmakers offer powerful ethical critiques of specific forms of violence. This is a fine work of scholarship that sets a high standard for the discussion of African film. The book brings together—perhaps for the first time in a work of this magnitude—two centers of gravity in African film as it exists now: Francophone West Africa on the one hand and post-apartheid South Africa on the other. Dovey undertakes a thoughtful exploration of the question of adaptation from literature to film. Once in a while a book is published that instigates a paradigm shift in how we view an object of study. Lindiwe Dovey’s African Film and Literature is one of them. By paying attention to African films primarily as films in the process of more complex ethnographic, historical, and sociopolitical elaborations, Dovey delivers a gift to be celebrated. One thinks of the nuance of her observations in the same vein as those of C. L. R. James and his writings on American cinema.